The ending to this eagerly awaited Grade 1 was spoiled. Just as we were about to find out how good Death Duty is, Augusta Kate crashed out when challenging at the last to deprive those watching of a thrilling tussle up the run-in. Who would have won? Well, rider Jack Kennedy is convinced Death Duty had Augusta Kate covered and the fact the 5-6 favourite stretched nine lengths clear of Turcagua suggests he is probably right. 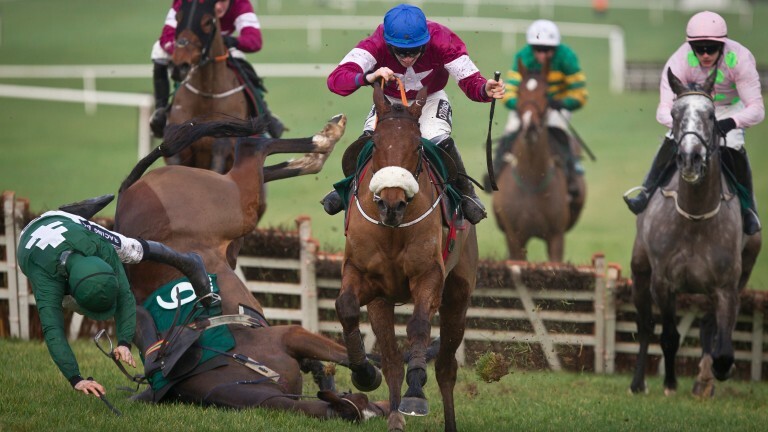 BoyleSports and Betfair Sportsbook reacted by trimming Death Duty into 5-2 (from 11-4) for the Albert Bartlett Novices' Hurdle and that is the preferred Cheltenham Festival target according to Gordon Elliott. "If Cheltenham were tomorrow I'd say he'd run in the Albert Bartlett, definitely," was Elliott's adamant reply when asked for his Festival preference. He added: "I'd say he's an out-and-out stayer and they didn't go fast enough for him out there. Bryan Cooper let him roll in his last two races from the third-last and galloped them into the ground, whereas today Death Duty was still on the bridle coming to the second-last. "Augusta Kate was upsides when she fell so it's hard to know what would have happened. Jack thought he had her covered. The one thing I do know is he'd have galloped all the way to the line. Our lad's a very good horse." Elliott said: "Of all the good horses I've had, none of them were as good as this fella over hurdles. He's a proper three-mile chaser in the making and nothing fazes him. It frightens you that he's so laid-back and he has a lazy way of going about things. He'll have a couple of easy weeks now and head straight to Cheltenham." It was a second Grade 1 success in the space of a fortnight for 17-year-old Kennedy, who was riding Death Duty for the first time on a racecourse. "I think I had Ruby covered," was Kennedy's answer when asked what might have happened had Augusta Kate stayed on her feet. He added: "We went very steady and my lad switched off. He does only what he has to do and I was only getting into full stride coming down to the last. He's done it well and is a nice one to look forward to." Despite the fall it was a most encouraging effort from Augusta Kate on only her second try over hurdles, and her famous owners –including Lee Westwood, Alan Shearer and Ant and Dec – have plenty to look forward to, provided she is none the worse for the spill. She was cut across the board for the Trull House Stud Dawn Run Mares' Novices' Hurdle at the Chektenham Festival, with BoyleSports going as low as 4-1. Her stablemate, the unbeaten Airlie Beach, is 3-1 favourite for that race. Betfair Sportsbook also cut her for the Neptune, going 16-1 (from 33).